Shopping for Conan the Barbarian Prop Replicas? The Conan Series Hyperborean 5-p Coin is struck at Shire Post Mint in the USA using antique equipment and traditional methods. The inscriptions are in the Bulgarian tongue, written in the Glagolitic script. This coin is the second smallest denomination of Hyperborea, a small brass 5-p of the realm. 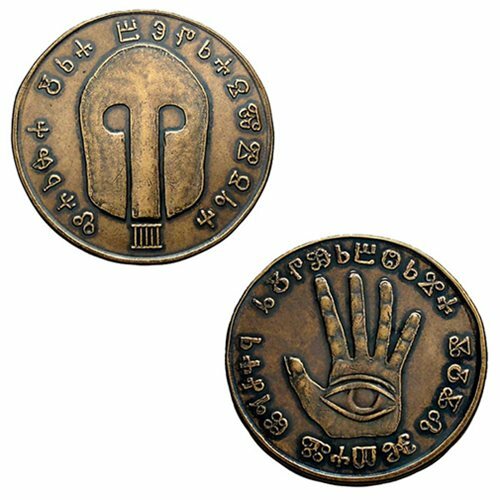 It features the "Hand" on the obverse, with the inscription "THE HAND SEES ALL." On the reverse, one finds the characteristic helm of the Hyperborean warriors and the inscription "RESISTANCE IS FUTILE," plus the denomination. Into the world of the Hyborian age, thousands of years ago before modern history began, strides Conan, a barbarian stripling of cold Cimmeria, who travels far and wide fighting and wenching his way across the world for decades, eventually finding himself crowned king of storied Aquilonia. Among his many travels, he visits Hyperborea in the northern kingdoms.